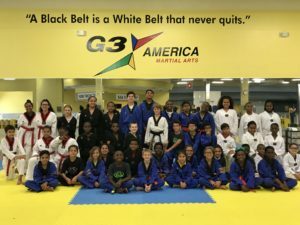 Our G3 America Martial Arts and After School programs are unique and developed to maximize every student’s potential! Our level programs and classes are designed to gradually and consistently assist our students to learn and grow their skills! Self Defense and Awareness: Students learn practical self- defense, ground and stand up techniques, as well as guidance on how to create self-awareness to avoid potential confrontations, attacks, and problems. As part of our curriculum, we present the students, especially our kids and teens, with different “real life experiences”, showing them options on how to handle them properly, minimizing their outside exposure. Physical Conditioning: Our fitness, strength, and conditioning exercises focus on building proper physical and strength to develop balance, coordination, speed, and resistance, to assist and support each student’s progress. Techniques: Our progressive curriculum is designed to break down exercises and techniques, giving students the proper base to learn the correct technique in order to continuously assist their progress. Our exercises are divided into 3 categories: footwork, handwork, and submissions. Olympic Athletic Training: As part of our advanced curriculum, our Olympic training focus on building the qualities of high-level TaeKwonDo Olympic Black Belt Athletes to compete in national and international competitions. This program includes the technical and strength/conditioning aspects of training. Character Development: This area focuses on developing character and life skills such as discipline, self-confidence, teamwork, public speaking, and leadership through exercises during classes and daily leadership talks. Lucas Rodrigues, Head Instructor and Owner of G3 America Martial Arts, is a 4th Degree Black Belt and originally from Brazil. 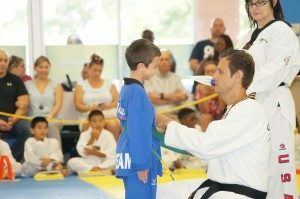 Instructor Lucas started Martial Arts when he was a young teenager and after 5 years of practicing Capoeira (Brazilian Martial Arts), he was invited to try out TaeKwonDo in 1996. Since then, he hasn’t stopped. Instructor Lucas Rodrigues trained under Master Fabio Goulart, in Santos, where he rapidly became part of the competition team winning many state and national tournaments and championships, such as the 1997 and 1998 Brazil Open. In 1997, Lucas earned his black belt through Master Fabio Goulart and moved to the USA to train, teach and compete internationally. Instructor Lucas’ goal is not only to share his knowledge and experience as a former athlete but as a current coach and instructor to make a positive impact on the character development and lives of students and to raise National, International and Olympic Champions. Lucas Rodrigues earned a degree in Business Administration in 1998 and opened his first Training Center in Brazil, Santos, at the age of 20. In 2010, Instructor Lucas found the true meaning of his life and calling in Jesus Christ and since then his life has been transformed and devoted to seek and fulfill God’s will in his life, through the relationship with our savior Jesus Christ. ” The greatest thing in life is when God uses us to accomplish His will in someone else’s life. It is an honor to serve our God and to love and serve others. And G3 America Martial Arts honors God through our love and dedication to all our students honoring His calling in our lives” says, Instructor Lucas. Caroline Rodrigues, After School Director and Co-Owner of G3 America Martial Arts, has earned her Criminal Law Degree in Brazil and since she moved to the United States she has invested her life into the wellness field. As a professional massage therapist, Caroline has earned certifications in Brazil, Thailand, India, and the USA with approximately 12 years of experience. She is on the way to earn her Black Belt and loves working with kids. Our Team of Instructors are WTF Certified Instructors from the USA, Brazil, Chile and South Korea. Together, we bring years of experience and knowledge that give us the ability to continuously develop an extraordinary curriculum and provide exciting, fun, and challenging classes!! Our Team of Counselors and Assistants are trained and skilled to provide a safe, structured, and fun atmosphere to promote growth and to assist our students in the process of developing great decision making!! 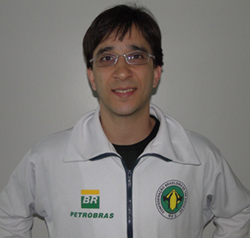 Master Fabio Goulart, owner of Fabio Goulart Academy, throughout the years, has accumulated many titles, such as 1991 Pan American Gold Medalist, National and South America Championships, and among others, represented Brazil in the 1999 World’s Championship as an athlete and captain of the Brazilian National TaeKwonDo Team. Not too long after, he was appointed as the Junior National Coach where he stayed until 2010. Master Belmiro Giordani, who also trained and graduated as a black belt under Master Fabio Goulart, is currently the Coach for the TaeKwonDo Brazilian National Team. He started TaeKwonDo under Master Fabio Goulart when he was 3 years old and collected, throughout the years, many different titles, including 4 x National Championships, South American Championship, and Pan American Championship, among others. Contact us to sign up for classes today!